It is a new surgical technique of bariatric surgery; which purpose is to achieve an adequate weight loss and end all diseases associated with obesity. It consists of a Duodenal Switch, in which only an anastomosis or intestinal junction is needed. - Patients with super-obesity (BMI> 55-). - Patients in whom Gastric Sleeve has failed. - It is performed by minimally invasive surgery. - A Gastric Sleeve or Vertical Gastrectomy is performed. - Grape and section of the duodenum 3 cm from the pylorus. - Duodenum-Ileal anastomosis in loop at 2.30mts ileocecal valve. - The pylorus is preserved, which prevents alkaline reflux. - Decreases the surgical time. - It avoids the opening of the mesentery with the possibility of internal hernia development after it. - It has a restrictive component, by the extirpation of the greater curve of the stomach. - Malabsorptive component, since there is a common channel of 230 cm. - More than 90% of the excess weight is lost after one year of the surgery. - Glucose control the first week after the surgery. - Normalization of glycosylated hemoglobin levels three months after the surgery. - There is a 3% to 5% range of risks, which include infection, bleeding, atelectasis, thrombosis, anastomosis or stapling line leakage. - Analytical monitoring is necessary to avoid malnutrition. - Psycho-nutritional connection to achieve a new lifestyle. Gastric Bypass México cuenta con un equipo de médicos especializados lidereados por el cirujano bariatra Dr. José Castañeda Cruz, un cirujano bariatra líder en México, con más de 9,000 procedimientos practicados con éxito en su haber. Todos nuestros especialistas están certificados y han sido capacitados tanto en México como en el extranjero. 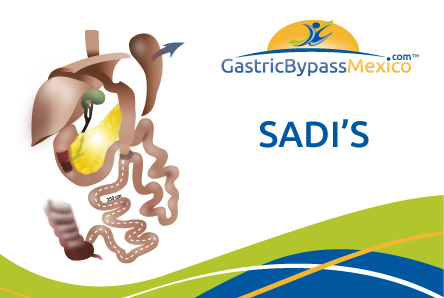 The SADI-S is not reversible, since a vertical gastrectomy is performed that modifies the size of the stomach. What does Laparoscopic Gastric surgery mean? Since when has the procedure been done? SADI-S emerged in 1988 and is one of the most complex and laborious bariatric procedures to date. It is the ideal surgery for patients with BMI greater than 50% who also present comorbidities such as hypertension and type 2 diabetes. It is not advisable to consume alcohol during the first six to eight weeks after the surgery. Keep in mind that a SADI-S surgery causes alcohol to be absorbed faster and patients often feel intoxicated quicker, even with smaller amounts. If the SADI-S is performed laparoscopically the scar will be minimum. In Laparoscopic surgery, a long incision is not performed. The Surgeon makes five small incisions through the upper abdomen and these are closed, either with surgical glue or soluble staples. Scars are usually healed in two or three weeks, and their appearance will fade away with time. Patients must follow a liquid diet during the first month after the surgery. Your Doctor will work with you to establish a specific diet guideline, taking in account the different physical and health conditions of each patient. What happens if I feel very hungry after the surgery? Most patients experience a dramatic appetite reduction after having a SADI-S surgery. It is recommended that patients follow a healthy diet to minimize any cravings, along with cutting back on unhealthy foods. Often there is a physical and psychological component in cravings, and it is important to learn how to distinguish each one. Patients are coached in healthy practices before their surgery. Mortality is up to 1% in laparoscopic surgery, however, in Gastric Bypass Mexico the rate is 0.036% for this surgery. Certain existing medical conditions may improve after weight loss surgery including GERD, high blood pressure, sleep apnea, high cholesterol or Type 2 Diabetes. It is important that you report your current medical conditions to your Doctor before the surgery, who will advise you specifically about your case. Patients who undergo a SADI-S surgery should follow a puree and liquid diet for about a month. As soon as the patient can tolerate food without vomiting, other milder foods followed by solid foods will be included. Patients should chew all foods thoroughly and ensure that drinks are not consumed with meals. Some patients may find that fatty foods cause them diarrhea and some foods rich in starch bloating and gas. Your Doctor will work with you to develop a diet plan in each of the recovery phases. The risk of developing blood clots after a surgery is higher and physical activity can help reduce it, which is why exercising is recommended after the surgery. It can also diminish gas accumulation problems and help accelerate the weight loss. Most of the patients are usually recommended to take a high-quality multivitamin, calcium, and iron daily. Some must take an additional doses of vitamin A, D, K, and B12. Generally, patients can return to work after 2 or 3 weeks after the surgery, depending on the physical nature of their tasks. Some patients experience nausea and weakness, so the handling of heavy machinery or work with physical needs is not recommended. Your doctor will provide you with specific recommendations. This information will be given to you by your Doctor before the surgery, and your levels will be tracked for a while after the procedure. Patients who undergo a SADI-S procedure must stay for 2 nights at the hospital. In some cases, if the stay is longer, the Doctor will properly inform. The SADI-S is a surgery with which an accelerated weight loss is usually achieved, since the capacity of the stomach is reduced and the fats and nutrients absorption in the small intestine is modified. This type of operation may have some important health risks and is not recommended for all patients. How much weight will I lose with a SADI-S surgery? After performing this type of surgery, the patient can lose between 70 and 90% of excess weight after the first year of operation has elapsed; In addition, according to global statistics, a successful SADI-S helps to cure Diabetes Mellitus type 2 in 80%, hypertension in 95%, dyslipidemia 66% and sleep apnea in 75%.